I really want to start and end this post with the mango and only mango, as this is probably my last mango based recipe for this whole season. I have a plan to pen a few other recipes. Let's see whether I can bring up those before this month ends. Before I move on to the recipe, I wanted to share about few things which I read recently and definitely not related to food. Its all about handling our negative emotions. As far as I know women are more spontaneous in showing their emotions easily when compared to men. And the article I read was guiding the ways to control our negativism at workplace. We can apply the same rules in our personal life to lead a more optimistic way of life. It is easy for someone to show off their emotions in front of family members rather than at a workplace. Exceptionally I have come across a few who lose their temper at work place too. Ok now, let me share few tips to wind this topic quickly. 1) Watch your feeling and observe the effect of body. Find it whether it comes from emotional state or from mind. 2) Watch your body language and react instantly in the way that makes you happy even if you someone tries to demotivate you. This gives more positive and upbeat feeling. 3) Analyse your emotions and the reasons for outburst. Try to work on it to fix it. 4) Analyse the decisions you take as a result of emotions. Next time, take a moment and decide your reaction. 5) Simply write down all your emotions in a piece of paper and handle it when you are free. Do other important work-which helps you to work effectively both at office and home. I thought it would be useful for all and shared here for my readers. Please ignore if you don't like reading it. 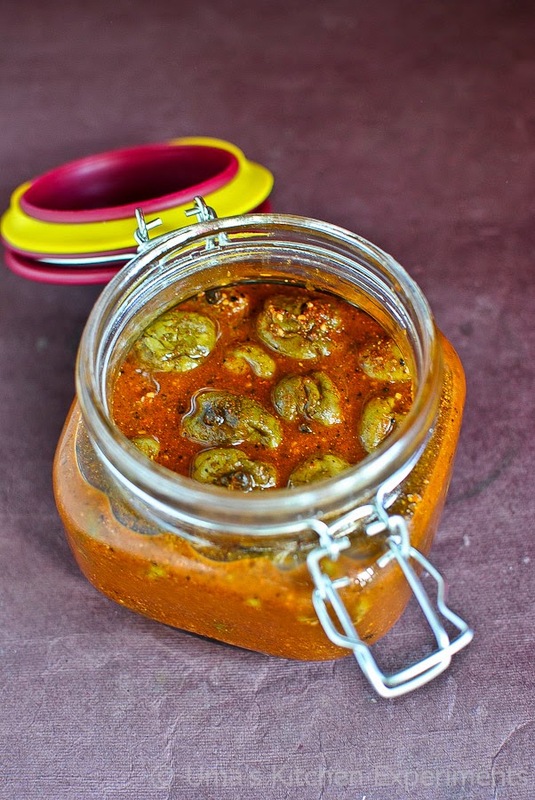 Let me come to today's recipe - Vadu maanga or Maavadu Oorugaai which translates baby mangoes in red chilli flavored brine - if you directly translate it to English. It has one of the easiest pickling process. Just clean them, mix with salt and keep it aside. Add the red chilli powder at last after 5-10 days and enjoy it with any rice of your choice. But it pairs well with curd rice. Addition of red chilli powder is optional. My aunty makes it every year with the small mangoes she grows in her back yard. 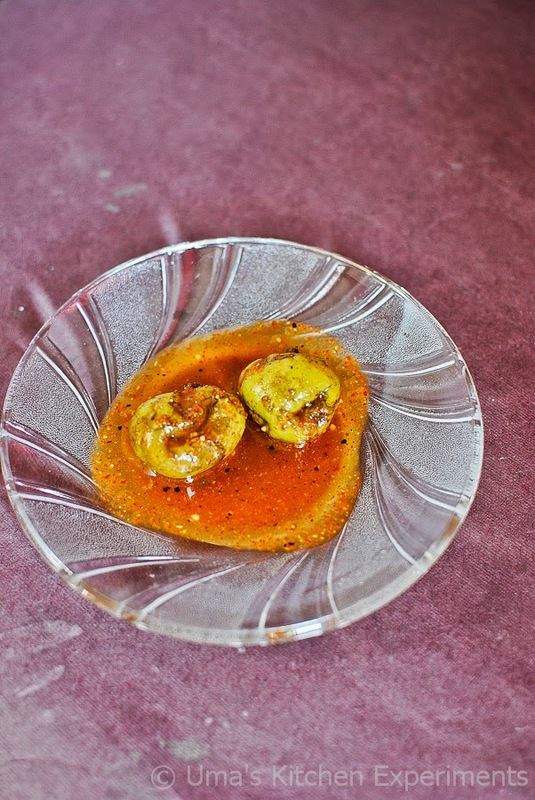 She likes it to have it without red chilli powder and adds little water as she prepares it in small quantity. But now, I didn't add water. 1) Wash and wipe the mangoes using a clean kitchen towel. 2) Take the mangoes in a clean and dry wide bowl. Pour castor oil or gingelly oil and toss it to coat to the mangoes. 4) Keep it in an isolated place for 4 - 5 days. Shake or toss well two times a day. I do it in the morning and evening. 5) After few days, the water content from the mango's starts to ooze out and slowly the mangoes start to shrink. 6) On day 5, dry roast dry red chilli, mustard seeds and fenugreek seeds. 7) Cool down the spice mixture and grind it to a smooth powder. 8) Add this mixture to the mangoes and toss it well. 9) Keep it aside for a more day and then it is ready for consumption. 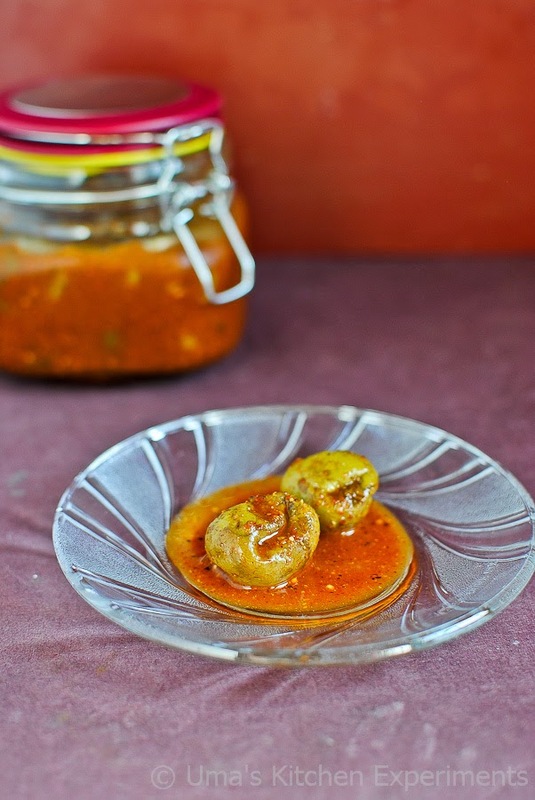 10) Serve it with curd rice. 1) Choose uniformly sized mangoes with 1/4 inch stem attached to it for long shelf life. 2) Along with salt you can also add powdered dry red chillies, mustard and fenugreek seeds instead of adding them at last. 3) Handle with care, use dry spoon. This aids in making the pickles have a longer shelf life. 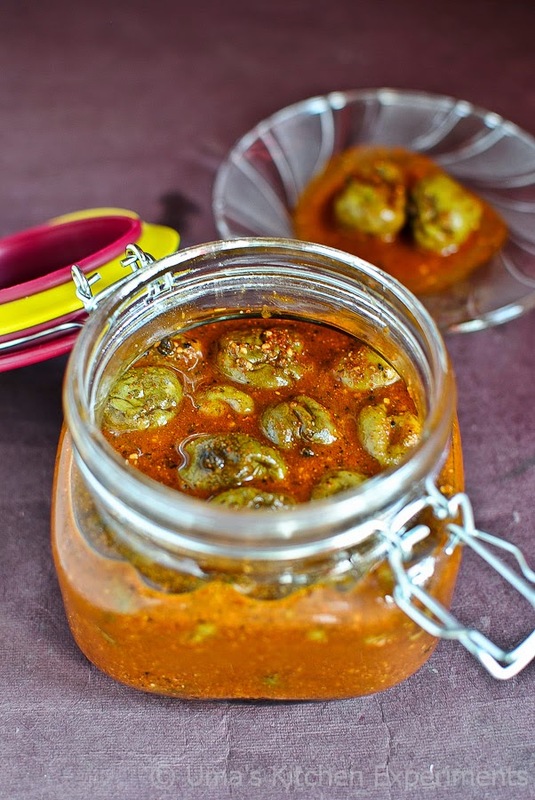 nice easy to make pickle.. Temper is a state where we give the power to other peesons stupidity.it means thw more we react the more vakue for others stupidity.the same holds for anger, revenge and any ither emotion thats beyond limits.keeping cool and composed help us make our life peace and more meaningful.it gives us more room to enjoy wat life has offered us. Well written Uma.. tats a grt post abt emotsss n mangoesss.. grt pickle..